If you're the kind of person who reads philosophy blogs, you've probably heard of inverted qualia thought experiments. The most famous example is red-green inversion: The red-green invert is someone who has reddish color experiences when she looks at green things (grass, leaves) and has greenish color experience when she looks at red things (blood, ripe tomatoes). Since the invert, like the rest of us, learns the meaning of color terms by example, her language and behavior is entirely, or at least virtually, indistinguishable from anyone else's. She uses the English word "red" to refer to the color of blood and "green" to refer to the color of grass, despite the difference in her color experiences of those things. In a talk at UC Riverside a couple of weeks ago, Saul Kripke asserted that no philosopher had ever suggested the possibility of sound-color qualia inversion -- that is, the possibility of a person who experiences sound qualia when stimulated by light and color qualia when stimulated by sonic vibrations. Let's be clear that Kripke was not denying the possibility of synaesthesia. He was not denying that people sometimes (for example) experience colors alongside sounds when stimulated by sounds. Kripke's claim, rather, was that no philosopher had contemplated a true sound-color qualia invert -- someone who normally experiences sound rather than color when stimulated by light and color rather than sound when stimulated by sonic vibration and whose language and behavior from the outside is indistinguishable from that of non-inverts. Kripke said this twice. I told him I was pretty sure he was wrong and that I had read such a discussion. Kripke challenged me to send him the citation. After a little research, I turned up my source: an unpublished essay by one of my graduate students, Nathan Westbrook. When I asked Nathan whether he knew of any precedents, he said he didn't. I also tried asking someone who had recently published a review of the qualia inversion literature; he too said he didn't know of anyone who had advanced that type of example. * The contest is open until June 14th or until someone delivers a satisfactory example, whichever comes later. * To be satisfactory, the discussion must be published in a reputable philosophy journal or press. * To be satisfactory, the discussion need not ultimately endorse the possibility of color-sound qualia inversion, just take it seriously. * If more than one satisfactory example is submitted, the person who submits the best example will be declared the winner, where I will judge "best" impressionistically, criteria including but not limited to: the length and quality of the discussion, the prominence of the writer or venue, and how seriously the possibility is taken. * If more than one person submits the best example, the first person to submit the best example will be declared the winner. * Submit your example as a comment on this post or by email to me. For the record, I lean toward thinking that sound-color qualia inversion is possible in a conceptual/metaphysical/pulling-it-out-of-my-a-priori-hindquarters-for-the-little-that's-worth sense of possibility. Color experiences famously differ along three dimensions: hue, saturation, and lightness or brightness. They also differ in egocentric, subjective location. To work an inversion with sound, we need a one-to-one mapping of dimensions of variation. Subjective location would appear to be easy, since both colors and sounds have subjective location. Since brightness and saturation are both unidimensional, we might be able to map them one-to-one onto pitch and volume, which are also unidimensional. Hue varies in a bit more complex a way, with red-green as opposites and blue-yellow as opposites, but perhaps patterns in the overtone series could be used. Probably the hue-overtone series mapping would require some tweaking to work, but presumably human-like beings with a slightly different set of visual and auditory capacities could exhibit a clean mapping (e.g., if the beings were only capable of discriminating certain patterns in overtone variation). Another complication is our much higher sensitivity to variation in visual as opposed to auditory position. But I don't see why, for the purposes of the thought experiment, we shouldn't be liberal about such matters: The sound-color invert, for example, might be an invert only of a relatively poor-sighted person and/or might have an exquisite appreciation of subtle variations in the position of sound sources subjective location of sound qualia. I continue to be struck by my finding, last week, that great philosophers produce their most influential work at a very broad distribution of ages. (Nifty chart here; if it's blurry click a second time to enlarge.) Physicists and mathematicians, in contrast, are reputed to peak early. Einstein notoriously said "A person who has not made his great contribution to science before the age of thirty will never do so". 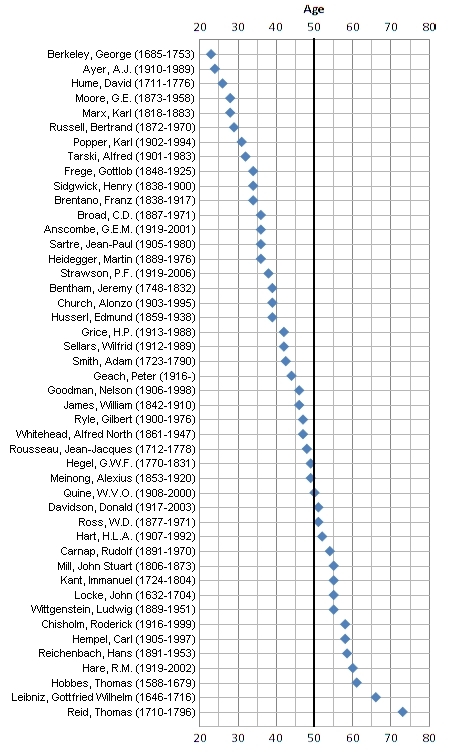 Stephan and Levin (1992) have compiled data on the age at which Nobel-Prize-winning scientists did the work leading to the Nobel Prize. (The data could use updating, admittedly.) Their data confirm that scientists do tend to peak fairly early (even if not as early as Einstein suggests) -- in their mid-thirties. 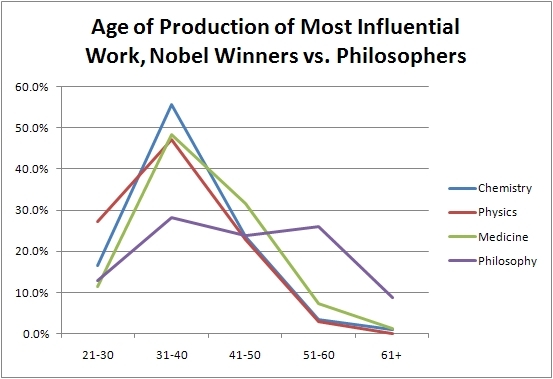 The graph below contrasts the distribution of ages at which scientists did the work earning them the Nobel with the (approximate) distribution of ages at which leading philosophers born before 1920 did their most influential work (see the earlier post for my method; one tweak on that method: I used Google Scholar to break the two ties). Note that while chemistry, physics, and medicine all peak sharply in the 30s, philosophy distributes evenly across the 30s, 40s, and 50s. Note also that although there is almost no Nobel work done by scientists in their 60s or older (0.8%, according to Stephan and Levin), in my sample -- admittedly small, just 46 philosophers -- 8.7% of great philosophers' most-cited work was done at age 61 or older. So take heart, my gray-haired friends! Yesterday, Paul Hoffman died of a heart attack. He was a great scholar and colleague. I will miss him terribly. At a talk on Monday, John Fischer announced his own coming talk on why immortality might not be so bad, to be given Wednesday. Howie Wettstein said from the audience, "we should all live so long". We all heard it as a joke, of course. One of Paul's last acts as a philosopher was to argue during the question period after John's talk that he saw no impossibility whatsoever in the idea of enjoying continual bliss in a never-ending embodied life. One of the wonderful things about Paul as a colleague was his immunity to groupthink, his ability to bring to discussion a different perspective and fresh set of considerations. I always enjoyed hearing what he had to say, especially when we disagreed. Paul's forthright independence of mind was also, I suppose, what made him such an interesting historian of philosophy. 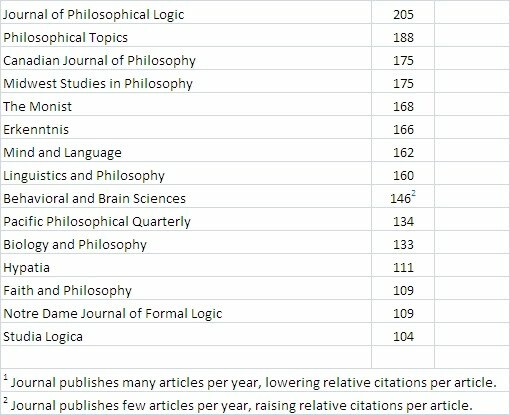 A philosophical discussion arc, as I defined the term a couple weeks ago, is a curve showing changes over time the use of a name or a word as a "keyword" in philosophy books and articles listed in The Philosopher's Index (which dates back to 1940). Previous posts showed discussion arcs of various prominent philosophers. But I've also been searching by topic and subfield. 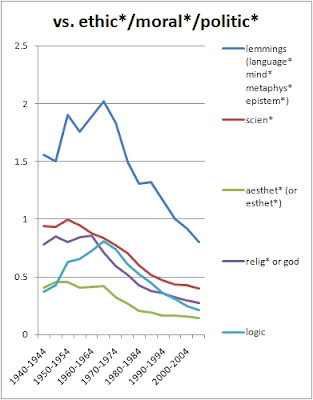 One striking general result I've found is the rise of discussion in ethics relative to other philosophical subfields. I don't know whether to find it alarming or exciting that if trends continue philosophers will soon be producing 100,000 articles and books per five-year period in some subfields. What I am interested in here is not so much the absolute numbers, though, as the relative numbers. And not even the relative numbers per se, which may be somewhat misleading (since not all and only epistemology articles contain epistem* as a keyword, and the keyword false negatives and positives may differ by subfield), but rather the changes over time in relative numbers. 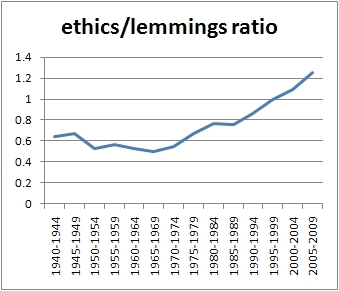 In the chart above, for example, you will see that in the 1990s ethics (EMP: ethics, moral, political) crossed lemmings (language, epistemology, metaphysics, and mind). 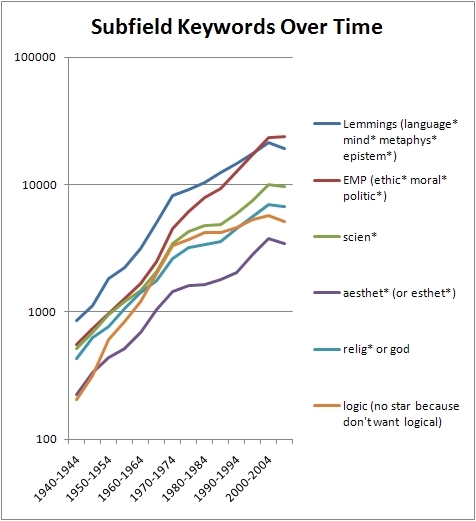 Assuming relatively constant false negatives and positives over time within each subfield, the crossover suggests that ethics has been growing faster than has language, epistemology, metaphysics, and mind. 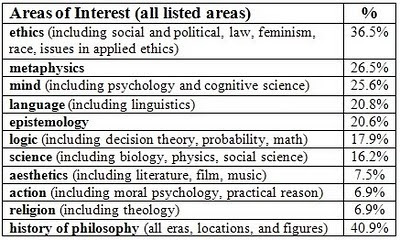 In the 1950s, about half as many books and articles had an ethic*/moral*/polit* keyword as a language*/epistem*/metaphys*/mind* keyword. Now there are more EMPs than lemmings. 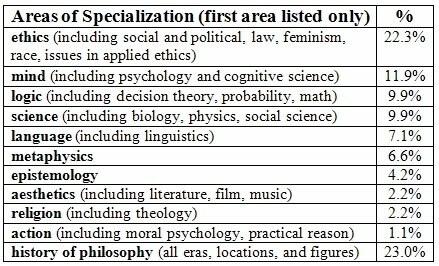 Feminism is now a major philosophical research specialization, as was not the case before the 1970s. The chart below displays its explosive rise. (In the denominator is EMPlemmings: all articles using any of the EMP or lemmings keywords.) 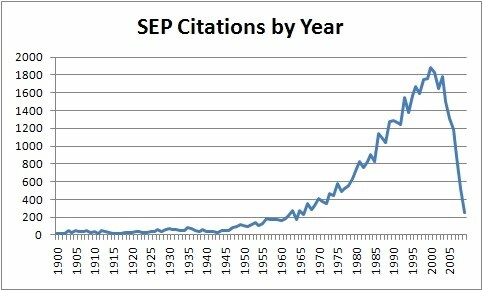 Notice that the rise is almost entirely in the 1970s to early 1990s. The trend has been flat to declining since then. 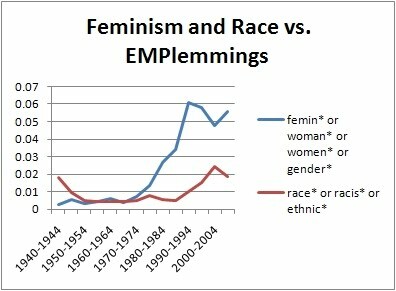 The same chart shows a U-shaped curve for discussion of race. I double-checked a sample of the 1940s articles to see if they really did treat race or ethnicity as a substantive topic (rather than, say, using a phrase like "the human race" in the abstract simply to mean people), and almost all did use "race" in the intended way. In the context of World War II, race was I suppose a rather hot issue! Interesting that it should be less so, at least in the philosophy journals, in the heyday of the civil rights movement. Yesterday, I posted a list of the forty most-cited contemporary authors in the Stanford Encyclopedia of Philosophy. A number of people have expressed interest in seeing further down my list, so I am expanding it to 200. * "Contemporary" means born in 1900 or later. 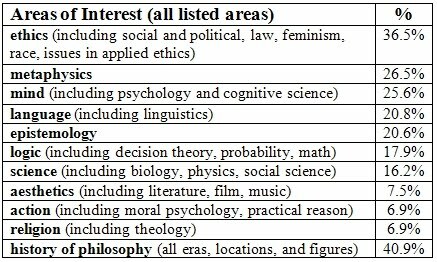 * I excluded historical entries, so historians of philosophy will be underreprested. * Each author is counted only once per entry, and then only if that author receives a bibliographical line on the entry's main page, as either first or solo author. * The distribution of entries in the SEP should be expected to overrepresent the interests and perspectives of the editors of the SEP, and in particular the SEP has a strongly "analytic"/anglophone perspective. 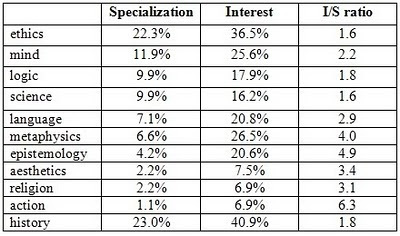 * This measure emphasizes breadth of influence over depth. 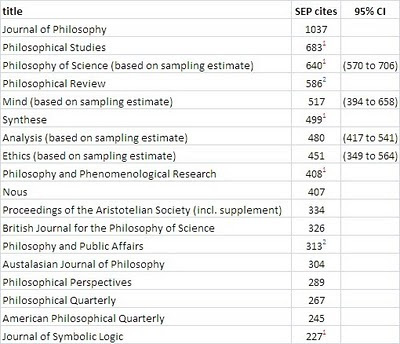 As part of my background work on discussion arcs, I compiled all the bibliographic entries in the Stanford Encyclopedia of Philosophy, excluding the purely historical entries, and I noted which philosophers were cited in the most different entries. 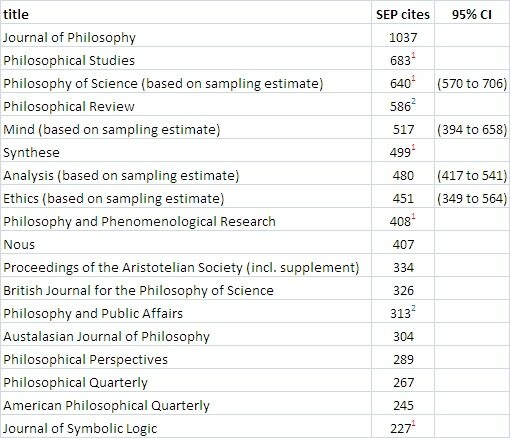 With those caveats, then, here are the top forty contemporary philosophers on the list (in parens are the number of SEP entries citing them; I examined 664 SEP entries in total; "contemporary" means born 1900 or later). I find one omission particularly striking: Thomas Kuhn, cited in only 29 entries. (Karl Popper is a near miss at 37 entries.) Kuhn's omission probably reflects, in part, the SEP's underweighting of issues in general philosophy of science; it probably also reflects this measure's favoring of breadth over depth of influence. The absence of "continental" figures like Foucault (13 entries) and Sartre (23 entries) reflects the generally "analytic"/anglophone pespective of the SEP (though Foucault and Sartre do have historical entries devoted to them). Comparing these results with Brian Leiter's informal survey last year, the top three results are the same (setting aside Wittgenstein, Russell, and Heidegger, who are not "contemporary" by the present standard), though Leiter has Rawls beating Quine. 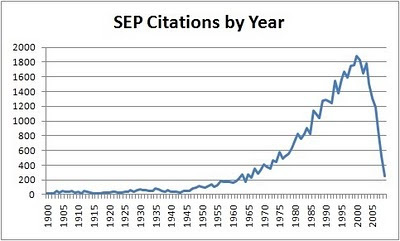 That might be another factor influencing the poor showing of Kuhn (whose most cited work was in 1962) and, as Brian Leiter points out, of Hart, whose most cited work was in 1961 -- though Quine (1960) still does very well. I have expanded the list to 200.